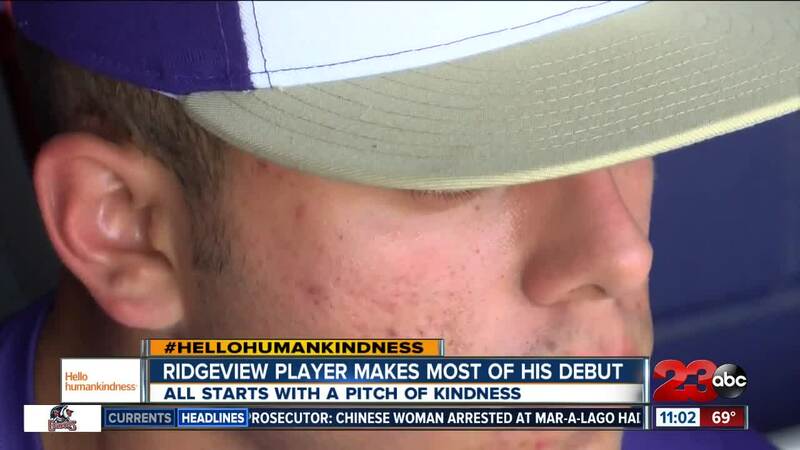 BAKERSFIELD, Calif. — West High and Ridgeview High School came together to make one autistic player's first appearance at the plate special. “I was running and nobody was catching me with the ball," said Ridgeview baseball player Marvin Castaneda. "I run and run and i make it, and they all be happy." For Marvin Castaneda and his Wolf Pack, that moment was something they'll never forget. “It just warmed my heart," said Ridgeview senior Miguel Castillo. "Just seeing him and how happy he was. He can look forward to for the rest of his life." “I signaled over to the coach and he called timeout and he got his team together, and I guess the senior pitcher, Luis Arroyo, it was his idea, 'let’s do the thing where we kick the ball around the field and let Marvin run the bases' and the team agreed," said Ridgeview baseball coach Robert Shahan. Marvin's coach and team says an in-the-park home run in his very first season is fitting for an athlete like Castaneda. "He comes to all the practices, he gets his reps in," said Castillo. "Every opportunity he gets, he’ll go in and work very hard." “He’s persistent," said Shahan. "He comes out here every single day. The first day he was out here he could barely play catch and most guys are going to quit after that, but he kept on coming." Castaneda says he has improved since joining the team. “I just try my best," said Castaneda. "I think I’m getting better at baseball."